It's been awfully quiet on the Marshall Mathers front of late, but the good news is that Eminem is now hard at work on his first new album since 2004's Encore. 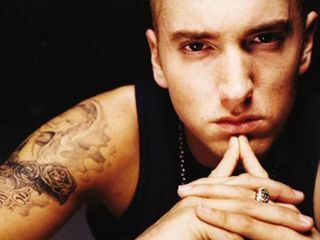 And, according to rapper Bishop Lamont, a protégé of Dr Dre's who also records for the Aftermath record label, Mathers has recorded some "amazing stuff" for his long-anticipated comeback album. "Em is excited," says Lamont. "He's been quiet too long, and he's got a lot to get off his chest. He went through what he had to go through. And now he's been able to take all the pain and stress and put it out in his music." Eminem gave his own brief update last month, telling listeners to his Shade 45 channel on Sirius Satellite Radio, "Everything is good. I'm just in the studio now working on songs." Although no release date or official announcement has surfaced, Eminem's label, Universal Music, also confirmed the artist is in the studio. As for a possible title for Em's sixth disc, King Mathers has been floated.